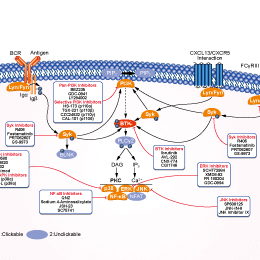 In B cells stimulated through the B cell receptor (BCR), BMS-986142 potently inhibits signaling and functional end points, including calcium flux (IC50 = 9 nM), production of cytokines, proliferation, and surface expression of the costimulatory molecule CD86 (IC50 = 3−4 nM). In T cells, ITK-catalyzed phosphorylation of PLCγ1 stimulated through the T cell receptor (TCR) is at least 45-fold less potently inhibited by BMS-986142 than BTK-dependent signaling end points in B cells, as expected based on the 30-fold selectivity for BTK over ITK in the enzymatic assays. In multispecies pharmacokinetic studies, the absolute oral bioavailability of BMS-986142 is 93% in mice, 67% in rats, 33% in cynomolgus monkeys, and 100% in dogs. The total body plasma clearance of BMS-986142 is low in all species. The large steady-state volume of distribution observed is indicative of extravascular distribution, in spite of the high protein binding. However, brain penetration is very low in rats (<5% of plasma concentration). BMS-986142 blocks the increase in severe proteinuria in a female NZB/W lupus-prone mouse model in vivo. Treatment with BMS-986142 provides robust protection against tubulo-interstitial and glomerular nephritis, as well as inflammatory infiltration. To V-bottom 384-well plates were added test compounds, human recombinant BTK (1 nM), fluoresceinated peptide (1.5 μM), ATP (20 μM), and assay buffer (20 mM HEPES at pH 7.4, 10 mM MgCl2, 0.015% Brij 35 surfactant, and 4 mM DTT in 1.6% DMSO), with a final volume of 30 μL. After incubating at room temperature for 60 min, the reaction was terminated by adding 45 μL of 35 mM EDTA to each sample. The reaction mixture was analyzed by electrophoretic separation of the fluorescent substrate and phosphorylated product. 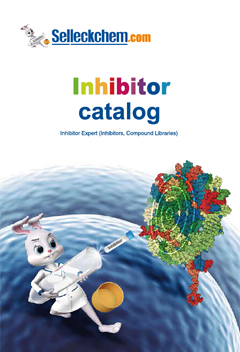 Inhibition data were calculated by comparison to control reactions with no enzyme (for 100% inhibition) and controls with no inhibitor (for 0% inhibition). Dose−response curves were generated to determine the concentration required for inhibiting 50% of BTK activity (IC50). Compounds were dissolved at 10 mM in DMSO and evaluated at 11 concentrations. B-cell receptor (BCR)-stimulated phospholipase C (PLC)-γ2 phosphorylation in Ramos B cells: After 1 hour of pre-incubation of Ramos B cells in media containing 10% fetal bovine serum (FBS) with varying concentrations of BMS-986142 at 37°C, the cells are stimulated with AffiniPure F(ab’)2 fragment goat anti-human immunoglobulin (Ig)M at 50 μg/mL for exactly 2 minutes at 37°C, followed by addition of ice-cold phosphate-buffered saline for quenching. The cells are pelleted and lysed, and PLCγ2 levels are measured by immunoblot using rabbit anti-human phosphoY759-PLCγ2 and analyzed using the Odyssey Infrared Imaging System with normalization to an actin control to ensure consistent loading. Gillooly KM, et al. PLoS One. 2017, 12(7):e0181782. Scott H. Watterson, et al. J. Med. Chem. 2016, 59(19):9173-9200.